The space on the Square will be able to accommodate about four thousand visitors. 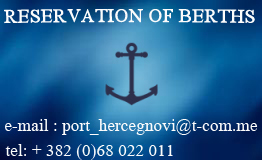 Herceg Novi has a long tradition of New Year's Eve on the main square. "Shifting the position of the organization in the most attractive part of the city, we believe that we will achieve extra quality," said Mayor Dejan Mandic. The organization's Eve will cost 40 thousand euros. Half of the funds will be provided by the municipality, and the other half of the Tourist Organization of the sponsors. In the following period should start promotion in Montenegro and the region. "At the upcoming tourism fair organized in Kragujevac from 28 to 30 November, will present the program of the New Year in our city, announced Bogdan Kočetanović president does. During the New Year holiday will work Light Hotel in Igalo Villa Margot and some smaller buildings, by the end of the week to open a hotel should declare owners Hungest hotel.